Ideas are immediately visible to your teammates once you add them to the Ideas dashboard. Your new idea will be listed in the Backlog and set at the Requirements stage to give your team the opportunity to offer input into the idea’s feasibility. Once you’ve created an idea, your next task is to decide which ideas you want to execute first. To help you structure a prioritized backlog, team members can score ideas. Scoring will help democratize your ideation process and empower your whole team to provide ideas and input. Scores are averaged evenly to create an overall score, which is visible on your team’s dashboard. You can score ideas from the dashboard by clicking the circle next to the idea name or from the “Scores” tab on the idea details page. Once an idea has been scored, you’ll want to change the status of the idea. 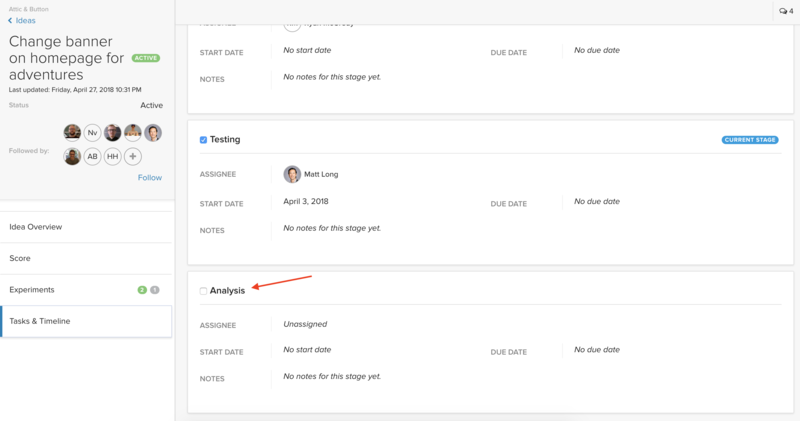 The status lets you know whether your ideas are currently being worked on. Users with Owner or Team Administrator permissions can change the idea’s status. An orange status indicates that it’s part of the backlog and hasn’t been prioritized. A green icon means that the idea is Active and is presently being worked on by the team. A black icon indicates that the idea has been completed and is closed out. Team Administrators or Owners will also change the stage of an idea. This allows teammates to have visibility to the progress of each experiment. The Administrator or Owner can go into each idea and simply check the box once each stage is complete. A box will pop up confirming the stage change to the next stage in the process. An idea is most commonly associated with a single experiment (and is easier to develop and execute if this is the case), but on rare occasions, it can be tied to a number of experiments. Some reasons why you might need multiple experiments could include an idea that needs to be implemented in different regions with different design needs or if it will be developed on both the website and an app. This level of visibility helps to ensure your team is not only internally kept up-to-date on the status of projects, but also allows anyone with access the ability to communicate with authorized people and groups outside the project, such as stakeholders or non-team members who submitted an idea on the exact status of an experiment. Imagine how much easier it would be to let an intern or assistant loose on your weekly update e-mail to the company if all they had to do was check the dashboard!